Many hugs to you CardiacDork. Ours is a truly humbling profession. This is quite true. Despite what people may believe about the validity and overuse of NETY, I think few would disagree that pure abuse - bullying in the real, truest sense of the word - is something that should continue to exist in any profession. I wish you well with your ANA panel and do hope you find yourself in kinder work environments in the future. Best of luck. Please use the "quote" button at the bottom of the comment box you want to respond to. Otherwise, we don't know who you are addressing. Thank you. Wonderful! I'm so happy to read this. Thank you for passing it along. I can very much appreciate this post, OP. My clinical experience was similar to that too. The instructor kinda floated around and went from student to student, while we were paired with other nurses. I can't remember if I ever hung an IV med as a student, but it was commonplace to give meds after our preceptor had made sure that we had pulled the right ones. In any event, I too was of the opinion that med errors and SA issues, and almost any other negative thing that could happen to nurses, happened to OTHER people. That I was impervious to anything bad and that surely I would know better. It took about a year for me to get out of that cocky attitude, but that's another story. I will never ever forget my first med error as a new grad working night shift. I had a tiny frail patient in her 80's and I accidentally gave her my other patient's metoprolol. This would have been back in 2006 and the facility didn't have a scanning system. I felt the same emotions the the OP expressed - hot, scared, nauseated. I broke into a cold sweat before going to my charge nurse, telling her what happened and trying not to cry. She calmly told me to call the doctor and then asked me what I thought we should do. I told her I guess all we could do was watch her very carefully and take her BP every 30 or 60 minutes. So that's what we did. We watched her like a hawk all night since she had low pressure to begin with. She ended up being fine, but that whole experience certainly knocked me down a few pegs. 1. Thank you, OP. This post is extremely important and long overdue. I did most of my grad research and papers on GLBT issues in relation to nursing and truly appreciate this gaining more attention. 2. I'm not sure how to address the statement "may not agree with transgender views" because to me that's like asking someone's opinion on a fact. "Do you think the sky is blue?" for instance. Transgender people exist and have since the beginning of time. Healthcare disparities exist for them. Both have been shown to be true. I have a trans family member, many friends, and have dated 2 trans people. I also identify as bisexual, was raised as Roman Catholic, went to a very liberal college and live in one of the most liberal cities in the country. BUT...I've also encounted my fair share of patients whose beliefs do not gel with mine. 3. It is beyond critical that we are able to care for ALL PATIENTS regardless of our differences. Not to do so is not only unethical and potentially illegal, but also devastating to the patient who a) will end up getting poor or improperly biased care and b) may therefore decide not to seek out future health maintainance which - as has already been mentioned - is a huge issue for all GLBTQI people. (Q meaning queer or questioning and I typically meaning intersex in my experience). 4. I was taught in nursing school, that it's typically a good idea for us to leave our values at home. Simply, this usually allows the patient to project a bit of what they need on us and it lets them feel safer. If my hospice patient needs to hear the Lord's Prayer because it'll help her sleep when she's so frightened, I'll say it with her even though I no longer consider myself Christian and am somewhat uncomfortable saying it. If my gay chemo patient's partner needs to talk to me about how she and her dying partner met, I'll listen. If listening to my male patient go through the dozens of sexual partners he's had that week in order to pinpoint who might have given him syphillis, then I'll help him try to figure it out. If my Witness patient, whose hct was 8 was refusing blood, that was his right. Only rarely have I opened up to a patient so honestly about my true opinions and that's been because I know they shared them and needed some kind of solidarity at the time. 5. For what it's worth, this is how *I* have addressed patients who have asked me tough questions that go against my beliefs when I was doing a clinical rotation in the south this past year. Sarcastic Patient: "So massachusetts passed that marijuana law, hunh? What do you think about anyone being able to get drugs now?" Me: "I think there are a lot of pros and cons with the issue and there are many differing opinions." Disgusted Patient: "There are so many gays now. No one was gay when I was your age. What do you think about that?" Me: "I think there are many different types of people in this world and as a healthcare worker its my obligation to respect and care for everyone." Bam. You're not lying. You're not compromising your beliefs. You are stating truths and you are being respectful to all patients. HOWEVER...if you are legitmately cocerned that you won't be able to keep your personal feelings and beliefs to yourself, then I do respectfully suggest you either expose yourself to more LGBT people to learn more about the population (studies have shown this has been one of the strongest predictors of whether or not someone ranks as homophonic along certain scales) or consider a profession that allows you to be vocal about your beliefs. Best of luck to you. I think that when you reach a point with a certain patient or family member, self-disclosure can be really beneficial and totally okay. I'm not an alcoholic. But I did grow up with one and went on to date many. I had a patient one night who had tried to kill himself because of his depression and drinking. His wife had finally left him and that was that. She came with him to the ER and was sobbing after we got him admitted to my floor. Long after he had settled in,sShe seemed frenzied and kept trying to keep me in the room for a while. I told her I had to check on other patients, but I'd be at the nurses station when I was finished if she wanted to talk. A short while later when I was checking charts she approached me and thanked me. I hadn't told her anything about myself. I had just been in the room and listened a little to his story. Or maybe she felt safe to leave him with me for a little while instead of taking care of everything herself. And she told me it's just so hard. And I nodded and said, "Well...it's none of my business, but good for you for having the courage to make the changes that you have. It's really important." And she started crying really hard and hugged me (! Not something that happens too often) and thanked me some more. And I asked her if she knew about Al-Anon and she said she did and I said to keep going. Because I understood exactly where she was coming from. And I know, from the tone in my voice and the look in her eyes, that she believed me. We're human too. I think it's really important that patients know that. Thanks for the great post, Viva. 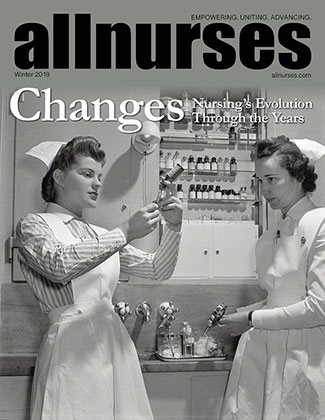 I agree that sometimes MD's need an ago stroke and can often be intimidated by us as nurses. A tactic that has worked for me (once I've called a MD or confronted him/her directly with a questions) and was subsequently yelled at or gotten made to feel stupid is to take a deep breath and say something like "I see. Well, in the future, when *would* I xyz?/give these medications/call you for clarification/etc?" Or "Can you help me to understand why xyz instead of abc?" It presents an opportunity for learning and makes it seem like you aren't questioning their judgment, but are instead eager to learn from their all-encompassing wisdom. I have had the fortune of having the vast majority of my interactions with MD's be positive. When the above hasn't worked for me (and sometimes even if it has) I let things cool down a little and then approach the MD directly. If that doesn't work or their behavior continues I go straight to the attending, my manager, and/or the director. Good article, but the last paragraph leaves a bitter taste in my mouth: "I wish I could say otherwise, but after being publicly slapped down, I will think twice before speaking up around him again. Whether that was his intention, or whether he was just being thoughtlessly callous, it’s definitely not in my patients’ best interest." I think it's in everyone's best interest to elevate the level of professionalism that nurses hold. And if we can't speak up for ourselves, how can we be expected to be good advocates for our patients? Awesome! Thanks for that! :) Actually, shortly after I posted this question I came across an old post from 2008 about how there were NP's in Australia. The thread linked to some youtube videos about NP's in Australia and I got a lot of my questions answered. I still doubt they would take me without any NP experience so maybe I'll be waiting another 3-4 years or so, but that's okay. At least now I know I could work there! Thanks again.